Why do com­pan­ies chose to set up a pres­ence in social media? It makes much sense to find B2C com­pan­ies on Face­book and Twit­ter, but what about B2B? 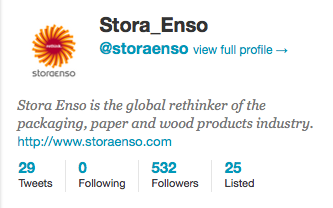 Stora Enso has chosen to fol­low no one and has tweeted only 29 times to its 532 fol­low­ers. What’s the pur­pose with a twit­ter account that looks like this?